6th International Che Guevara Conference a Huge Success! However, the numbers do not tell the whole story of the conference and its theme, “Cuba: A Socialist Project in Progress.” When the International Che Guevara Conference began in 2008, its objective was to bring Che Guevara's ideas to as widespread an audience as possible, and to use the Cuban Revolution as a living, breathing, winning example of how to build a better world. With every year the conference has grown, and shown, that Che Guevara and the Cuban Revolution are as important as ever. This year's conference was particularly relevant, given that it came hot on the heels of the December 17th victory, when all 5 Cuban Heroes unjustly imprisoned in US jails were finally returned to Cuba as part of the announcements made by Cuban President Raul Castro and US President Barack Obama that the two countries would work toward normalization of relations. This came after over 50 years of US attempts to blockade and isolate the island. Cuba was in the news, as it deserves to be, and the Che Guevara Conference was taking place in Vancouver and Kamloops to discuss the history, context and prospects of the Cuban Revolution. A gigantic 70 square foot photograph of the Cuban 5 Heroes back together in Havana hung next to the stage as the concert and celebration of their freedom opened the 6th International Che Guevara Conference. The evening itself was opened by Tamara Hansen, coordinator of Vancouver Communities in Solidarity with Cuba (VCSC). Kenia Serrano Puig, President of the Cuban Institute of Friendship with the Peoples (ICAP) and part of the 6 person strong Cuban delegation to the conference, helped set the tone by speaking passionately about the significance of the Cuban 5 victory, not only for the Cuban people, but for the entire world. When Cuban 'Nueva Trova' legend Gerardo Alfonso took to the stage, there were absolutely no seats left in the hall as 250 people packed together for his highly anticipated performance. Gerardo did not disappoint, switching seamlessly between piano and guitar, through different moods and tempos, while his voice kept the audience mesmerized throughout. He took time between songs to explain their meanings related to life, love and revolution. It was a beautiful evening, and a fitting tribute to the Cuban 5 Victory as well as an opening for the 6th International Che Guevara Conference. 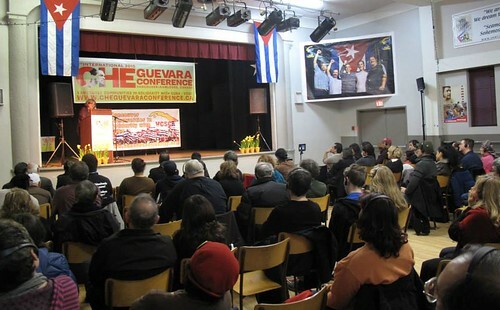 When over 150 participants arrived to the hall for the first day of workshops of the Che Guevara Conference, they were were greeted by a room covered in Cuba solidarity banners and historical photographs. Another massive photo of Fidel, Raul and Che speaking during the early years of the Revolution was at the front of the room with the Cuban 5 photo. Participants were also given thick conference packages with information about about the program, speakers and upcoming Cuba solidarity events. This was also the first Che Guevara conference which was translated simultaneously in Spanish and English for its entirety, and all of the program was also live-streamed to the Internet for people form around the world to watch in real time. The conference was once again opened by VCSC Coordinator Tamara Hansen, who was joined by VCSC organizer and Fire This Movement Movement for Social Justice Editorial Board member Aaron Mercredi. The conference began with a keynote address by Dr. Jose Luis Rodriguez Garcia titled, “The World Capitalist Economy and the Deterioration of Humanity.” Dr Rodriguez Garcia is a former Cuban Minister of Economy and Planning, and was also Vice President of the Council of Ministers and a member of the Council of States . He gave a detailed analysis of the dynamics of the current capitalist crisis and how different capitalist countries are unsuccessfully attempting to overcome it. He concluded that the current crisis has given socialism a new relevance among people looking for an alternative, and that we need to take advantage of this new opening and its opportunities. Toronto based journalist and author Keith Bolender was next, giving a workshop titled after his new book, “Cuba Under Siege: American Policy, the Revolution and its People.” Keith argued that it is impossible to understand Cuba with understanding the overall context of constant attacks by the United States and their effects on the island. The audience was very interested, and discussion carried on into his book signing which followed during the lunch period. Keith completely sold out of his first book on Cuba, “Voices from the Other Side” and had only 2 copies of his new book left at the end of the conference. Returning for her 4th consecutive conference, Dr. Aleida Guevara spoke about, “Cuba's Healthcare System: Where Humanity Comes First and the Principle of Revolutionary Internationalism.” Dr. Guevara spoke of her own experience volunteering for many years on Cuba's internationalist missions in Nicaragua and Angola, as well as Cuba's current world leading fight against Ebola in West Africa. She referenced her father, the legendary Che Guevara, his legacy as a revolutionary doctor, and his conception of healthcare as a human right which Cuba could teach the world to respect and provide. Also returning to the conference was Alberto Prieto, Coordinator for North and Central America for the Central Committee of the Communist Party of Cuba. He workshops was titled, “Latin-America and the Emerging Revolutionary Process.” He outlined the emerging revolutionary processes in Latin-America, and the attempted counter-revolution being attempted by the United States. He discussed new Latin-American regional organizations such as CELAC (Community of Latin-American and Caribbean States) and said, “We are attending the funeral of the Organization of American States,” to a loud applause by all those who for decades had watched the US and Canada use this increasingly irrelevant organization to impose their interests upon Latin America. There was never a shortage of people lining up at the microphone to ask questions or to offer their opinions on the topics being discussed. The discussions continued during the meal breaks, as different groups of people, many of whom had never met, spoke animatedly about the issues while eating delicious El Salvadorean food. The first day of the conference closed with a Special Session, “The Importance of the Struggle for the Freedom of the 5 Cuban Heroes and the Future of the Cuba Solidarity Movement in North America.” Before the keynote address, Nino Pagliccia presented an introduction to his newly released book, “Cuba Solidarity in Canada: 5 Decades of People to People foreign relations.” Nino outlined the many contributors to the book, which includes a chapter on Cuban 5 organizing written by VCSC and Free the Cuban 5 Committee – Vancouver members Tamara Hansen and Ali Yerevani. Tamara also spoke more indepth about the organization of the Cuban 5 work in Vancouver, especially the 110 monthly pickets. Kenia Serrano gave the key note address, and summarized the long, hard international campaign waged to Free the Cuban 5 Heroes, as well as the immense joy of the Cuban people now that they are returned to Cuba with their families. While she reminded people that Cuba still needs friends in important struggles to end the US blockade and return Guantanamo Bay to Cuba, she put Cuba's struggle within the context of a international movement of oppressed people fighting for their rights, and the need to unify to accomplish the goals of everyone. With the historic Cuban 5 victory in mind, and with eyes set firmly on future victories, Day 1 of the International Che Guevara Conference ended on a high note! The third day of the conference opened with many faces from the previous day and others who were attending for the first time. People had found out about the conference in many different ways. Through Spanish, French, English and Farsi articles and advertisements in community newspapers, another advertisement in the Georgia Straight newspaper with its over 700,000 readers, posters and leafletting on all major post secondary campuses, hundreds more posters in community centres and small businesses in Vancouver and 5 surrounding suburbs, dozens of radio interviews in Spanish, French and English, as well as successful social media campaign which included bilingual promotional videos and the Twitter hashtags “#CheConf” and “#VanCuba”. The morning began with a special video presentation by Dr. Alerica Guevara titled, “Today I Released a Butterfly,” a moving documentary of interviews with the now adult children of the combatants who fought and died with Che in Bolivia. The film was produced by the Che Guevara Institute in Havana, which Aleida works closely with and is overseen by her mother. This was followed by a highly anticipated workshop by Javier Domokos, the Cuban Consul General in Toronto, titled, “US/Cuba Diplomatic Relations: What is the History and What are the Prospects?” . Consul Domokos gave a thorough summary of over 100 years of aggression against Cuba by the US government. He reminded people that Cuba was still vigilant because, “The US changed the policy, not the objectives.” However, he framed the new dynamic as a victory for Cuba which forced the US government to change by remaining steadfast and committed to its principles and Revolution. The conference package included two extensive articles by Dr. Jose Luis Rodriguez on the current economic situation in Cuba, and he elaborated on both during his presentation on, “Cuba's Economy Today: Progress and Challenges.” Dr Luis Rodriguez was the Cuban Minister of Economy and Planning during the hardest years of the “Special Period” in Cuba, when the Soviet Union fell and Cuba lost almost the entirety of its foreign trade overnight. His experience in the field is obviously unmatched, and his analysis was thorough in describing the complexities of Cuba's economic policies as it continues to build a society based on the principles of humanity and social justice. Dr. Aleida Guevara returned for one final presentation, titled, “Learning form Che.” In a fascinating talk she discussed the current situation in Cuba and the world, and how Che's ideas of creating a new human being were not only relevant in Cuba today, but present in the everyday lives of Cubans as they continued to build their society and country. She spoke about Cuba's important place in the world, about how the World Health Organization did not go to the US or Canada to confront Ebola in West Africa, they went to Cuba. She emphasized that the Cuban Revolution is too important to fail, and urged those present to follow Che's words regarding commitment and dedication to humanity. The audience then rose to its feet as indigenous elder Kelly White brought her drum to the stage and presented the Cuban delegation with a handmade Star Blanket to thank them for participation in the 6th International Che Guevara Conference. She had everyone chanting, “Viva Cuba!” and clapping in unison in a powerful demonstration of unity and solidarity. Day 4 - Kamloops Leg of International Che Guevara Conference Grows in Numbers and Enthusiasm! The large crowd was a diverse mix of international, university and high school students, faculty, and community members. There had been a significant presence in the community and on campus even before the event took place. A large conference banner hung in the main entrance to the TRU, and besides many posters in the hallways, the school's video screens showed an advertisement for the conference every 3 minutes. There was also announcements and advertisements on the campus radio station and newspaper. In the community, the local newspaper carried an advertisement and wrote an article on the event, and dozens of posters were put in libraries, community centers, and local businesses. The event was MC'd by Aaron Mercredi who is an organizer with both VCSC an the TRUSU Socialists Club. He began by welcoming everyone to the Kamloops portion of the Che Conference, and acknowledging the Sucwepemc territory that the event was taking place on. Kelly White, Coast Salish elder and media activist, gave a traditional acknowledgment of the territory and opened the evening up with Indigenous drumming and singing. Building on the themes discussed in Vancouver, Aaron explained that this conference was an important opportunity to understand Cuba in the world today and international politics from the people who are directly involved in leading the Cuban Revolution. He noted that that many people from Kamloops are among the more than 1.2 million Canadians who travel to Cuba every year, the Cuban Revolution generates a lot of discussion in the community. Especially now given the December 17th announcements by Presidents Raul Castro and Barack Obama regarding possible normalization of relations, and the release of all 5 Cuban heroes imprisoned in US jails. Aaron introduced the representatives of the Cuban delegation, Dr. Aleida Guevara, Dr Jose Luis Rodriguez Garcia and Alberto Prieto. Dr. Jose Luis Rodriguez Garcia spoke first regarding the Cuban economy. Using his vast experience as a former Cuban Minister of Economy and Planning and current researcher, professor and adviser, Dr. Rodriguez outlined the development of the Cuban economy from before the fall of the Soviet Union, through the the “Special Period” where Cuba struggled to survive despite the almost complete loss of its foreign trade, and on to the recovery of the Cuban economy amidst the worldwide capitalist crisis. Dr. Aleida Guevara spoke next. As a Cuban pediatrician who has participated in multiple Cuban medical missions, Dr. Guevara gave an overview of the Cuban healthcare system. Using the example of her father, the legendary Ernesto Che Guevara, she explained how the Cuba has continued to provide free high quality healthcare to all of its citizens, while also intervening around the world to treat sickness, disease and respond to the human crisis created by natural disasters. She also presented several impressive statistics from these medical missions, “Cuba has had medical missions in 158 counties worldwide. These missions have performed more than 10 million surgical operations, assisted 2 million births, given 12 million vaccinations to children and saved over 5 million lives.” The audience applauded in stunned admiration. Following this, Alberto Prieto spoke on the announcement of changing diplomatic relations between the United States and Cuba. As the current the Coordinator for North and Central America for the Central Committee of the Communist Party of Cuba and previous First Secretary of the Cuban Interests Section in Washington, DC, he has a lot of experience on the subject. He emphasized that one cannot understand the current events taking place today without understanding the history of the relationship between the United States and Cuba. Going back to pre-revolutionary Cuba, Alberto explained how the US has held a constant policy of interfering in Cuba's sovereignty. He emphasized that Cuba will continue to assert its sovereignty and its Socialist system, which the Cuban people have benefited from since 1959, no matter how diplomatic relations change with the US. A lively discussion period took place after the presentations. There were further questions specifically on the developing Cuban economy, on the Cuban healthcare system and how people living in Canada can learn from the Cuban example. Many people thanked the Cuban delegation for traveling so far to share their experiences in Kamloops. This was the second time the International Che Guevara Conference has visited Kamloops, and was again a huge success with participation more than doubling from the previous year. This is a sign that both the Che Guevara Conference and the general interest in Cuba have have grown. The TRUSU Socialists Club has been very active in Kamloops with different events on Cuba and Latin America, and working again with VCSC to organize the Kamloops leg of the International Che Guevara Conference was another excellent opportunity to build bridges in Cuba solidarity work. Due to huge demand, the Smorgasbord Cafe in Kamloops became the venue for an intimate concert by Cuban musical legend Gerardo Alfonso on January 27th. More than 70 people either found seats or an empty place to stand to enjoy the last event of the 6th International Che Guevara Conference, a special bonus concert celebrating the release of all of the Cuban 5 Heroes . Once again co-organized by the TRUSU Socialists Club and VCSC, this concert was an opportunity for Kamloops to take part in the international celebrations of the victory for the Cuban 5 Heroes. Aaron Mercredi once again opened up the event by reflecting on the last four days of activities - from the opening night's concert with Gerardo Alfonso in Vancouver, to two full days of workshops and special presentations in Vancouver, to traveling through the mountains to bring the conference to Kamloops, and now to the final night's special celebration. Aaron then explained the reason for the celebration, outlining the 16-year long struggle of groups around the world and the people of Cuba to free their 5 Cuban Heroes, and how this was finalized in a victory on December 17th of 2014 when the remaining three (Antonio Guerrero, Ramon Labanino, and Gerardo Hernandez) imprisoned in the US were released and flown back to Cuba. Two short movies were shown. The first documenting the emotional arrival of the three Cuban men and their reunion with their families and neighbours. The second was a personal video greeting that Gerardo Hernandez had recorded for the Che Guevara Conference, thanking Vancouver organizers for their consistent monthly picket actions in front of the US Consulate. Next, Gerardo Alfonso took to the stage! With 6 nylon strings and piano keys, Gerardo brought the room in to his world of melodies and poetry. Gerardo explained the themes and inspiration of all his songs, allowing everyone in the room a glimpse both into his artistic creation and his social and political principles. Going through his repertoire of love songs, songs against racism and against homelessness, human relationships and the love of Havana, Gerardo's voice conveyed the beauty and diversity that exists in Cuba today.